The question in this first volume is resoundingly clear: What can the peace-loving mice of Redwall Abbey do to defend themselves against Cluny the Scourge and his battle-seasoned army of rats? If only they had the sword of Martin the Warrior, they might have a chance. But the legendary weapon has long been forgotten-except, that is, by the bumbling young apprentice Matthias, who becomes the unlikeliest of heroes. 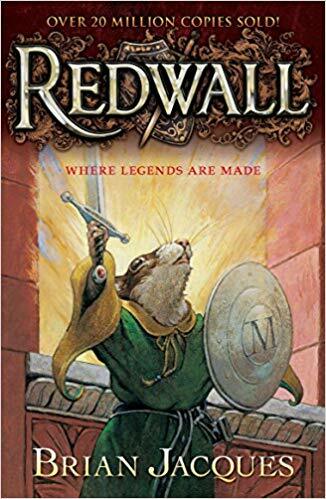 Teeming with riddles, humor, unforgettable characters, and high-bounding adventure, the original Redwall, the launching point for a series that has captured the world’s attention, features seven full-color illustrations by renowned illustrator Troy Howell. This new paperback edition is a must-have for both longtime fans and first-time readers. Redwall is one of my favorite childhood books and book series. I have read this book three times and have loved it every time. I enjoyed this series and still think about how much fun I had reading it and rereading it a few years ago. I believe any one older than nine will love this series. Redwall was one of my daughter’s favorite books and book series. She devoured these books and read all twenty-two of them. My son enjoyed them as well. I did not know about this series until (as an adult), I heard about them recommended on the What Should I Read Next podcast! I loved this first one and may have to continue on with the next books! I love that Jacques wrote it with blind children in mind. I could visualize so much of the story in my mind because of his wonderful descriptions! We love this series! If you enjoyed the first one I think you will enjoy the others in the series.